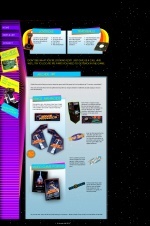 Through an update to the Flynnlives.com discussion forums, players were guided to a new company website - Arcade Aid. A link through the forums led directly to a puzzle of visual play on game titles (see below). At Arcade Aid, we know video games from the inside out. From motherboards to joysticks, we’ve got everything you need to refurbish your favorite machine. And our friendly staff has the know-how to identify your problem and to help you fix it. We totally get gamers because we totally ARE gamers. Our technicians understand your need to climb a cube-shaped pyramid filled with snakes, and we want to help you reach the top. We also share your desire to ride a bike through a suburban jungle and chuck newspapers at things. And princesses? We save them all the time. Now, for all you Flynn fans out there, you’ll be happy to know that Arcade Aid specializes in parts and accessories for classic Encom games like "Space Paranoids," "Arc Wars" and, of course, "TRON." So, take a look, spend some quarters, and get your game on with Arcade Aid. WE'LL TRY TO LOCATE THE PARTS YOU NEED TO GET BACK IN THE GAME. What’s the point of having a classic stand-up game unit if the panel art is all scratched up? Or worse, nonexistent? Recognizers are, and always have been, larger than life, and that’s just how they appear on our mint-condition side art for “Space Paranoids.” Look out above! Kevin Flynn’s magnum opus deserves to be decked out with the best art elements around. That’s why we offer everything you need to refurbish your “TRON” machine, right down to the decal that goes on the spin-knob controller. Even an obscure game like “Kraz-Bot” gets the royal treatment here at Arcade Aid. We pride ourselves on providing a wide array of art for every game title in the digital spectrum. Here’s another gem that doesn’t register on most gamers’ radar screens, but that doesn’t mean it’s not the bomb (pardon the pun). Freeze, perp! If you want game art for this Encom classic, look no further than Arcade Aid. Our selection is so great, it’s almost criminal. As you can see, works of art don’t just belong in a museum – there’s plenty of eye candy to be had at the old arcade! Whatever your gaming needs are, we got 'em covered. So why go looking for another company that knows nothing about gaming? They can't stop talking about us! Just listen to what some of our satisfied gamers had to say about the excellent service and selection we provide at Arcade Aid. "Before I contacted Arcade Aid, I couldn't get my frog across the street without getting squashed like a toad pancake. All it needed was a new joystick, so now I'm back in business and hopping logs with ease. Thanks, Arcade Aid!" --Fred B. "You know that game where you're supposed to jump the barrels that the psychotic gorilla is throwing at you? Yeah, well imagine how frustrating it would be if you couldn't jump. Arcade Aid had the perfect replacement button. Take that, you dirty ape!" --Alice J. Odd lettering around the map such as "3-42", "3", "2", "DBP"
Those who completed the puzzle by finding and naming all video games were awarded several badges and were linked to page where they were prompted to provide a photo of themselves for a forged Encom corporate ID, in a proposed joint effort to infiltrate Encom. Shipping of the packages is estimated at 2-3 weeks as of March 10th. Arcadeaid.com is updated with an extended game quiz map, now having 167 games to unlock. A puzzle with a bigger hidden agenda - 167 different images throughout this pixelated cityscape are individual representations of many random video games. This iteration is an expansion on the first version, with an added 111 games. All 167 must be solved. Those who completed the puzzle by finding and naming all video games were awarded several badges (after solving 89, 125, and all 167 game titles) and were promised a reward in the mail. This page was last modified 16:49, 18 November 2010.